Using Socrates Sculpture Park’s location on the East River waterfront as a starting point, Float is a series of works that challenge conventions of performance and site-specific practice through a variety of media. Each weekend features a unique schedule of events with performance-based projects and temporary installations beginning at 3:00 pm and video screenings at sunset. This program has been organized by Sara Reisman. Admission is free. 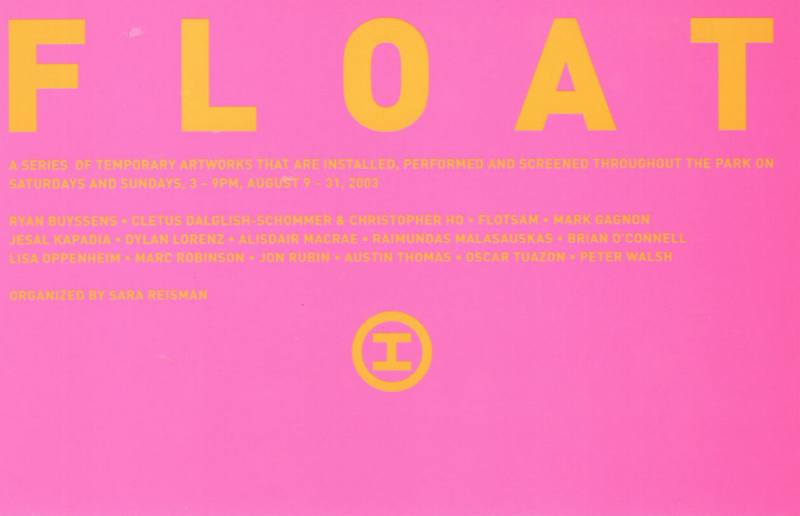 Socrates Sculpture Park is pleased to announce Float, a new project series taking place in the Park on Saturdays and Sundays in August. Referencing Socrates Sculpture Park’s location on the East River waterfront, Float is a series of temporary artworks that will be installed, performed, and screened throughout the Park on weekends from August 9 through August 31. The projects in the series challenge conventions of performance and site-specific practice through a variety of media and formats. Each weekend features a unique schedule of events including temporary installations by flotsam and Oscar Tuazon that address how public space and the built environment are regulated, while projects by Jesal Kapadia, Alisdair MacRae, and Peter Walsh take up environmental and geopolitical concerns that relate to the urban waterfront. Several installations on view throughout the series include a mural by Mark Gagnon, a project on tourism by Brian O’Connell, and Austin Thomas’s Perchance: A Floating Scenic Overlook. A video program including works by Ryan Buyssens, Jesal Kapadia, Dylan Lorenz, and Lisa Oppenheim will be presented on Sunday evenings at sunset. Highlighting the transition from day into night, Jon Rubin stages a performance of Floating Cinema in Hallets Cove, while Christopher Ho and Cletus Dalglish-Schommer project subtle moving images in the Park. Float opens with a one-night video program selected by Raimundas Malasauskas, and closes with a parade by Marc Robinson.